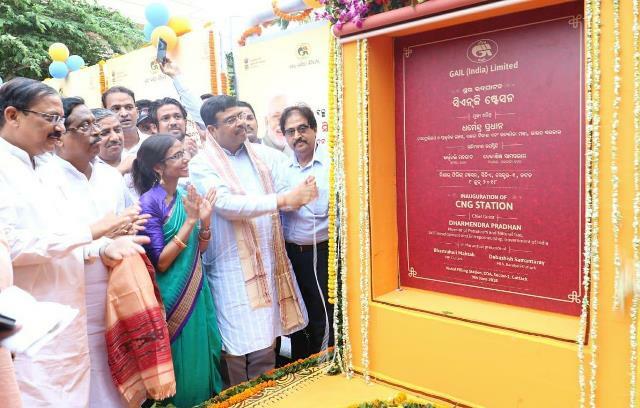 Home / POLITICAL-NEWS / CNG Gas Stations In Cuttack Inaugurates By BJP Dharmendra Pradhan. CNG Gas Stations In Cuttack Inaugurates By BJP Dharmendra Pradhan. Cuttack: In yet another significant development of the Pradhan Mantri Urja Ganga Yojana, Union Petroleum and Natural Gas Minister Dharmendra Pradhan inaugurated two Compressed Natural Gas (CNG) station here in Odisha on Saturday. The CNG stations, located at CDA Sector 1 and Bidyadharpur in the city, would provide the cheaper, environment-friendly and safer fuel to CNG-run auto-rickshaws, Pradhan said. With this, four CNG-dispensing stations have become commercially operational in the twin city of Odisha- Bhubaneswar, and Cuttack. Two more CNG stations are coming up at Khandagiri and Tamando, GAIL sources said. Earlier in December 2017, the Minister had inaugurated two CNG stations at Chandrasekharpur and Patia in Bhubaneswar.